For a zingy, spicy flavor bomb you can’t get much better than a freshly made laab classic Isaan dish of hand-chopped meat or fish braised and mixed with loads of chopped up shallots, herbs, ground jasmine rice and a tangy dressing. Lately I’ve been warding off winter sniffles by adding extra greens to just about everything, and I found this worked well with a chicken laab I made the other night. I’ve been buying organic curly leaf kale from the New World in Victoria Park; $3.99 gets you a huge bag of the stuff and it’s always fresh, healthy looking and not as thick and rubbery as kale can sometimes be. 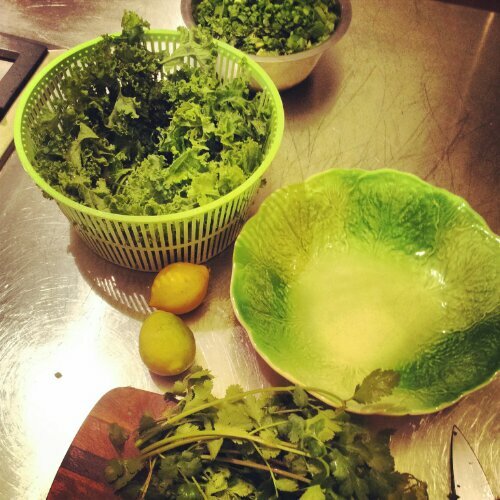 Here’s a quick recipe for a laab pimped up with extra greens. Here I also used fried shallots, rather than ground rice, for the textural element. This will serve four adults for a lightish meal – we like to spoon the laab into lettuce cups, you can also add rice if you want a more substantial meal. Using two cleavers or large sharp knives, chop 500g boneless, skinless chicken thigh meat into small pieces, almost like a mince. Hand-chopping the meat rather than starting with minced meat means you get a more tender result – mince tends to go a bit rubbery. Take about 150g kale and strip the leaves, ripping them into small pieces. Wash and dry well and place in a large bowl. Prepare your herbs and greens and set aside on a large platter for adding in quickly at the end of cooking: Slice three long shallots (or Thai shallots if you can find them) thinly. Roughly chop one bunch of coriander, including some stems. Slice a few lengths of spring onion. Cut one medium zucchini into very small dice, mirepoix size. 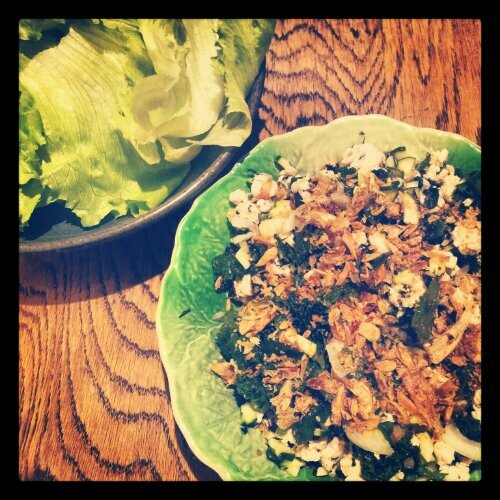 In a small bowl mix up dressing: Juice 2 limes, 2 Tbsp fish sauce. Now rub a little of this dressing into the prepared kale leaves – massage it in to break down some of the fibre of the kale and soften it. The leaves will darken, that’s fine. In a wok, bring 1/2 cup good unsalted chicken stock to a boil then turn down to a fast simmer and add the chopped chicken meat. Cook, stirring occasionally, until the chicken is cooked through – about 8 minutes will be enough. Turn off heat. Drain any excess stock out of the pan, reserving just a little of the liquid. Sprinkle over 2 tsp (or more, to taste) dry chilli flakes and stir through. Throw in the prepared shallots, greens and herbs, including the kale, and stir through. Add the lime and fish sauce dressing and stir through, then tip the laab out into the serving dish. Top with crisp fried shallots (available ready-made at Asian grocers’).